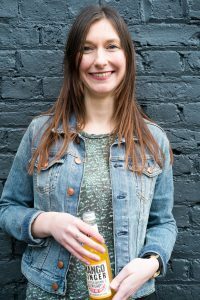 Kerstin Robinson left a career in finance to set up Nix & Kix, an award-winning drinks manufacturer challenging the non-alcoholic drinks market by adding a splash of spice for a kick of happiness. Together with business partner Julia Kessler, she is here to make soft drinks more “grown-up”. “I don’t wake up every day thinking ‘I need to challenge what’s out there’; it’s more about doing what I think is the right thing to do, and that happens to be challenging the norm. Our purpose is to bring more excitement and positivity into the boring and often unhealthy drinks market. We’re challenging the current lack of imagination, experimentation and passion in the soft drinks market. Purpose is the most important thing; without a purpose we wouldn’t exist. We’ve got bold flavours – mango and ginger, cucumber and mint, and peach and vanilla – that are very different to most other soft drinks available. And what makes Nix & Kix very special is the subtle cayenne that you get from all of our drinks. It adds that little extra kick which means we don’t need any added sugar to keep taste buds happy. Most drinks on shelf are either very sugary, or bland and boring. We started the brand with the goal to make exciting drinks that taste great without artificial nasties yet are still low in calories. Yes, we’re launching a challenger drinks brand into retail, on-trade and food distribution in the UK and abroad, and experiencing rapid growth while doing so, but we also have to stay focussed on ensuring that once we are on shelf, we stay there. Yet it’s so difficult to be heard in a very crowded market and convince retailers, pub owners and food service operators that a mostly unknown brand like us deserves a spot on their shelf. At our current stage, sampling is still the most effective way to get the drinks into people’s hands – consumers are usually pleasantly surprised when they try our drinks and will often buy them after having tasted them. Challenger brands need to be different to stand out, and most often need to try harder to gain consumers’ trust; when this is done in a way that feels authentic, it will be rewarded by consumers with their loyalty. We have always been inspired by BrewDog and how this brand, mostly unknown 10 years ago, has managed to start a whole movement and massively helped change the beer industry. As a business, we’re quite lean. We can change our strategy on a daily basis if we want, try out things on a small scale, learn quickly and implement more of the initiatives that worked. And so data does play a role, though we definitely do not use it enough. With so many tasks to complete every day we sometimes forget to take a step back and look at the bigger picture. It is amazing how much data is out there; the hard part is drawing the conclusions that are right and relevant for our business. Wading through these challenges comes back down to that purpose. It’s much more rewarding when there is a purpose that you can personally get behind. It’s much easier to get through the lows you find with every position once in a while.